**~ A POCKET FULL OF ROSES~**: LYNN'S HAVING ANOTHER BEAUTIFUL GIVEAWAY! LYNN'S HAVING ANOTHER BEAUTIFUL GIVEAWAY! HELLO SWEET BLOGGERETTES! I JUST WANTED TO LET YOU KNOW THAT LYNN IS HAVING ANOTHER BEAUTIFUL GIVEAWAY, SO IF YOU HAVEN'T STOPPED BY, JUST CLICK ON THE PICTURE BELOW AND IT WILL TAKE YOU TO HER WONDERFUL SITE! Hi Mari, just popping over to say hello. 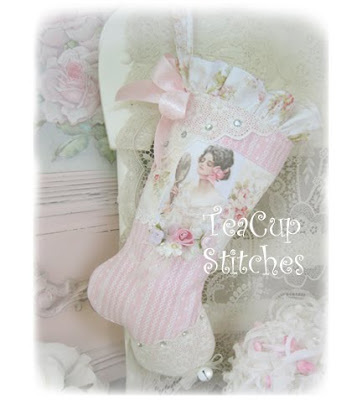 Isn't the stocking lovely! Wishing you a wonderful Holiday Weekend!! Such a dear lady you are to post about my stocking!! I get so excited when I see it here and have to do a little happy dance :-))) Thank you!! How is Miss Pebbles doing??!! I hope she is doing well on her new meds and giving you lots of extra cuddles! Hearing on the news about the record UgaMugga heatwave in NY and hope you have the AC cranked up and are staying cool! I ALSO PRAY YOUR POOCH IS DOING WELL??? I was just checking in to see if you had a new post about your cousin and didnt know you had responded to me here! Please keep us updated on your visit and how she is doing ok!! And enjoy your vacation in Florida! From one hot zone to another!! We decided not to have the surgery for Maxxie since our vet said there is a 50-50 chance of his surviving it. No way were we going to risk odds like that! So we are just going to give him lots of extra love and hugs - if that's even possible! - and be happy with every day we are blessed to have him in our lives. Hugs to you and your furry white little bundle of love! REBECCA'S HAVING A WONDERUL GIVEAWAY!! BRENDA'S HAVING A BEAUTIFUL GIVEAWAY!!! IM IN NEED OF YOUR PRAYERS!! !